There is a secret to having an epic summer with your kids and guess what? It is surprisingly simple! How would you like to have an epic summer with your kids this year? Epic? You know– the kind of summer that leaves a lasting impression on your kids. The kind of summer they will remember well into adulthood. Your kids don’t want expensive vacations. They certainly don’t need more toys. It doesn’t seem that easy though does it? Epic sounds complicated, busy. Epic sounds like a lot of work. Well, I have a secret to tell you. It really doesn’t take much to create that epic summer. Why not? Because you are what makes a summer epic instead of ordinary. Your presence. Your involvement with your kids is what will propel the long days of summer into legendary status. Your kids want to be with you. I get it though. School is almost out and everyone is just. plain. tired. That is why I came up with this fun summer calendar printable for you! There are 30 totally awesome ideas on the calendar so you don’t have to try and think of ideas yourself. If you do just 2 or 3 activities with your kids each week, by the time you head back to Target for back to school supplies, you will have all but checked off every item on that list! More importantly though, your will have had a blast with your kids, connected to them in a way that just isn’t possible during the bustle of the school year, and yes.. your summer will have been epic. 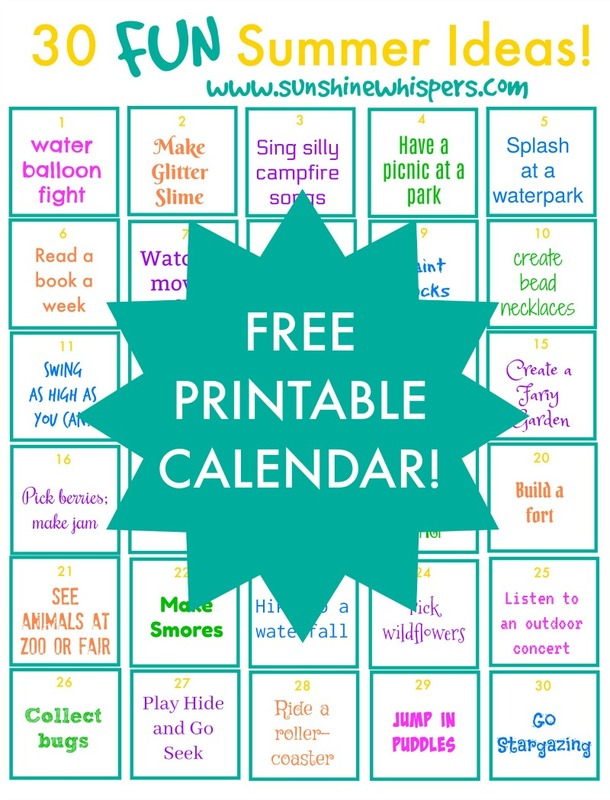 To grab your copy of the FREE Printable Summer Fun calendar, just click below! Have a fantastically fun summer this year!